You probably spent a lot of time thinking about what you named your cat. Maybe you came up with Mr. Felidae Cat-stro, or Meow-gusto Pinocat. Or Meowbarak. Cat-dafi. Meow-losevic. But don’t let your teeny dictator’s charismatic meows fool you. You need to be the one in control of their diet because it’s possible your vet is going to be weird about the obesity conversation—weirder than you. At least, that’s what some new research says. Domestic cat obesity is a real problem. Back in 1995, 35 percent of American cats were overweight or obese according to one study, and it’s unlikely the problem has decreased since then. Obesity isn’t only a health issue in humans. It can lead to diabetes, cardiovascular problems and decreased lifespan in pets, too. But when food is the usual way we reward our kitties, it’s hard to manage their weight—even when little Pussolini looks a little more Suidae than Felidae. Researchers from the University of Guelph and the University of Calgary in Canada found and watched 123 video-recorded vet-client interactions about cats. They found that, well, the conversations were awkward. Veterinarian (V): Yeah you wouldn’t want him [to get any bigger] no, maybe he’s getting more [food]. Just cut back otherwise. Client (C): A different kind of food maybe? C: Maybe there’s too much fat in the organic food? V: I don’t know the content but…Certainly an adult food I was gonna say is fine because of their size. V: Very nice (fur) eh? I was just going to say. Must have…must have lots of fat in that (laughs) food. C: Maybe I should change it to (laugh) something else. A light version of it or something. V: You can always bring in a label we can have a look cuz I don’t know there are so many different, comparing them is, uhh. C: So, I’ll see if this organic food…maybe it has…maybe the organic food has a like a lighter version of it (veterinarian nods) or I’ll check that size. V: A long time? Yes? As well. In other words, this vet really didn’t know what to say to the client about their fat cat. At the end of that visit, the vet told the client the cat needed to “cut back,” then gave the human some treats to give their cat. And then, “while the veterinarian was out of the room, the client gave the cat all the supplied treats, as well as took many more from the veterinarian’s supply to give to the cat, contrary to the client’s discussion of a possible diet change to curb weight gain,” according to the paper published over the summer in the Frontiers of Veterinary Science. This is obviously a tiny sample of the large number of veterinary interactions. As the authors write, “readers of this study are reminded that before generalizing the results of this study, that they might first consider the degree to which their circumstances mirror those of this study.” Plus, the visits happened in 2006, not 2017, so maybe the culture has changed around having these conversations. But the study shows that pet obesity is a complex issue. And it’s worth reading some of the transcripts in the paper because they’re pretty awkward. It seems it’s just as difficult for some folks to talk about obesity in cats as it is to talk about, well, obesity in general. The paper notes that vets aren’t giving clear, effective recommendations. I’ve reached out to a few vets to hear their thoughts and will update the post if I hear back. So, what comes next? 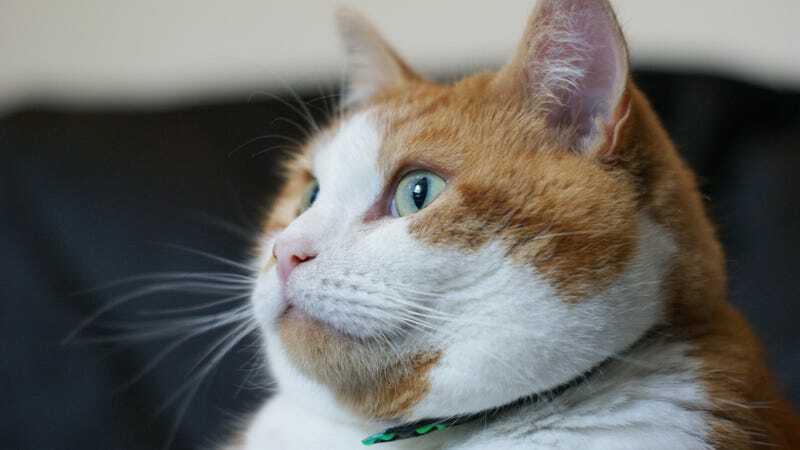 Well, the researchers hope that vets and vet organizations put more work into training vets in how to assess an unhealthily fat cat, explain the kitty’s problem to their owners and come up with treatment plans. There’s still a lot that scientists don’t know about animal obesity. But it would help if vets had better training on how to handle these conversations. And maybe you should consider buying the lighter food and giving fewer treats. Oh, and here’s a guide to your cat’s nutritional needs from the American College of Veterinary Nutrition.